Whynot, Carrie Helena, 103, of Liverpool. It is with heavy hearts we announce the passing of Carrie on Saturday, April 5th, 2014, at Ryan Hall, Bridgewater, N.S..
Born in Liverpool on February 23, 1911, she was a daughter of the late Stuart and Ida (Trott) Smith. Carrie was a beloved mother, grandmother and great grandmother. She was an avid knitter, bingo player and a wonderful cook. She loved to read and could “polish” off a novel in an evening before her eye sight failed her. 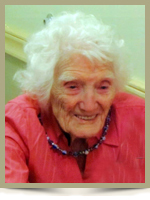 She held many jobs throughout her long life, mostly in the restaurant business. Carrie was loved by everyone who had the privilege of knowing her, as well as casual acquaintances. She will be missed by all and many who enjoyed talking and asking questions regarding changes she had seen take place in the last 103 years. She is survived by her adopted son (Grandson), Randall (Annette) Whynot, of Bridgewater; son, Einar (Dorothy), of Liverpool; many grandchildren and great grandchildren. She was predeceased by her devoted husband, Clayton Whynot; sons, Arnold, Clayton Jr.; a sister, Nellie; brothers, Gilbert “Gillie”, Lester, Robie, Vernon, Edgar, Henry, Lawson, Clifford, Victor and Norman. Carrie lived a long life ,loved by many and lived it doing what she enjoyed. I remember see Carrie at Bingo, years ago. My sincere condolences to her family and friends. I would like to send out my condolences for the loss of a very loving and wonderful woman. I have had the pleasure to have known Carrie for many years. We had some very good times during all the years we new each other with family on all sides. May you now rest in peace Carrie; you will forever be in my thoughts and prayers. So sorry for your loss our thoughts & prayers are with you. Carrie was a neighbor for many years & I knew her as a very hard worker with the most gorgeous rose bushes in all of Liverpool. Sincere sympathy to Einar and Dot and all the family. May she rest in peace. Einar and Dot so sorry to hear of Carries passing. She was a very hard working lady all her life. RIP Carrie. Einar and Dot, our thoughts are with. will be remembered in our hearts. Marjorie & Moyle Crouse & family. Aunt Carrie was the last surviving member of the SMITH family on my side . This really is a very sad time for me . She looked so much like my grandfather Mr.Gilbert Smith . What a wonderful Lady she was . May the peace that comes from the memories of times shared, comfort you now and in the days ahead. So very sorry to hear of the loss of Carrie, she was a large part of our lives growing up and I extend sincere condolences to the entire family. To the rest of the family of my Aunt Carrie,i was so saddened to hear of her passing…she was the last of my dad’s family,its uncanny how much she resembled my dad Clifford Smith….may you and your brothers and sister meet again in heaven,,,Rest In Peace Aunt Carrie. Sorry to hear of Carries passing, Many of us remember going to Claytons mill to get kyte sticks.She enjoyed a long life and will be missed by all who knew her. To all of Aunt Carrie’s family. I am so sorry for your loss. To the family of Carrie Whynot. I cared for Carrie at North Queens Nursing Home. We were all very saddened when Carrie moved as she was a wonderful lady. She lived a very full life and was a very caring person. We are thinking of the family as they go through a difficult time.